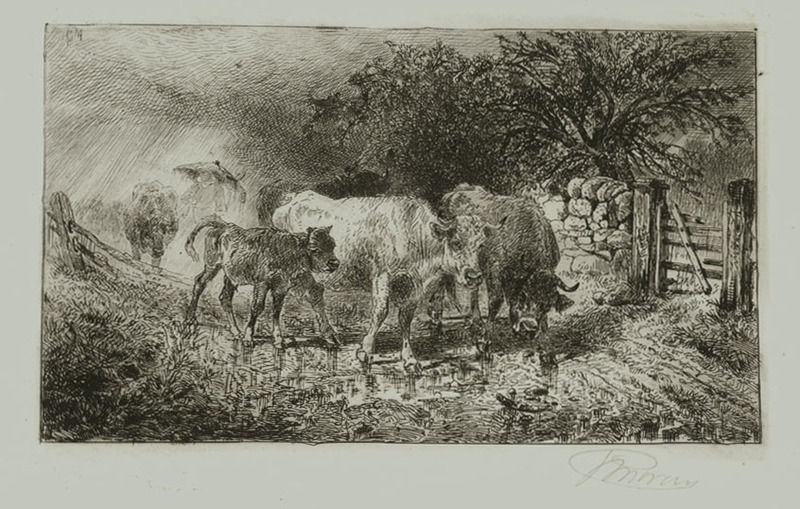 Etching, image size 19 x 11 7/8 inches, copyright 1892, pencil signed l.r. 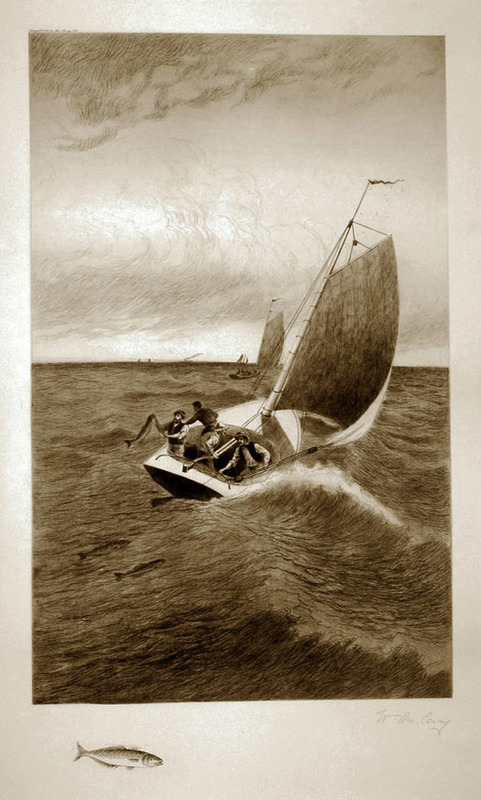 "William Mc.Cary", bluefish remarque l.l., "Copyright, 1892 by Max Jacoby, N.Y." u.l. A very fine original etching by Mary Nimmo Moran, image size 6 5/8 x 9 1/2 inches, 1885, published in Germany, plate signed and dated in reverse. A rich impression on a medium weight wove type paper with ample margins. Pencil signed "H A Webster" in the lower right. C. 1930. Catalog: Webster 105. Plate measures 7 3/4 x 10 7/8 inches on 9 3/4 x 12 7/8 inch watermarked arches laid type paper. Signed artist's proof. Plate destroyed. 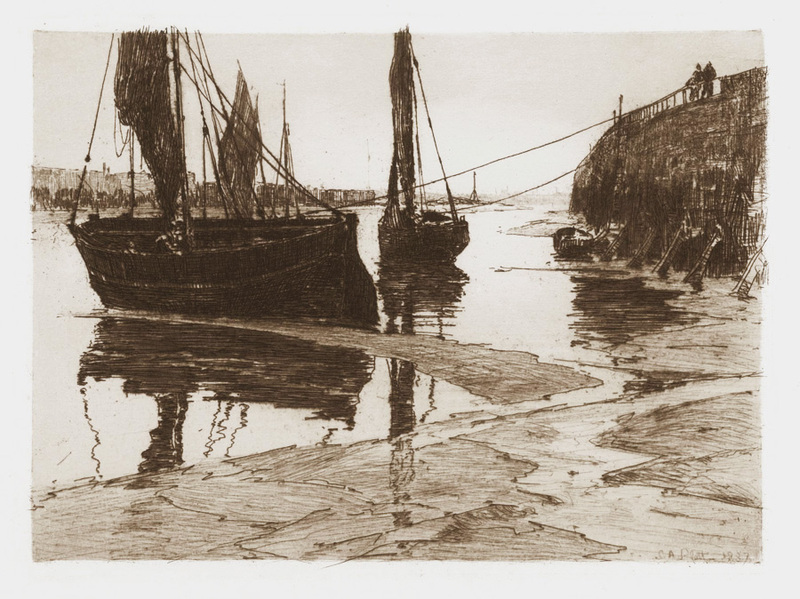 This print has a rich drypoint burr and dramatic use of light and shadow. Herman Webster was an American artist who moved to Paris in the early 20th century to attend the Academy Julien. There he studied under J. P. Laurens and Eugene Bejot, and was also greatly influenced by the etchings of Whistler and Meryon. 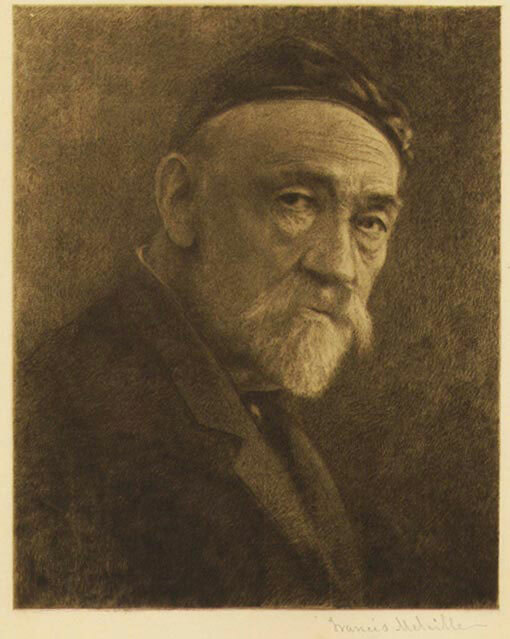 He traveled extensively throughout Europe, specializing in finely detailed architectural views, cityscapes and landscapes. 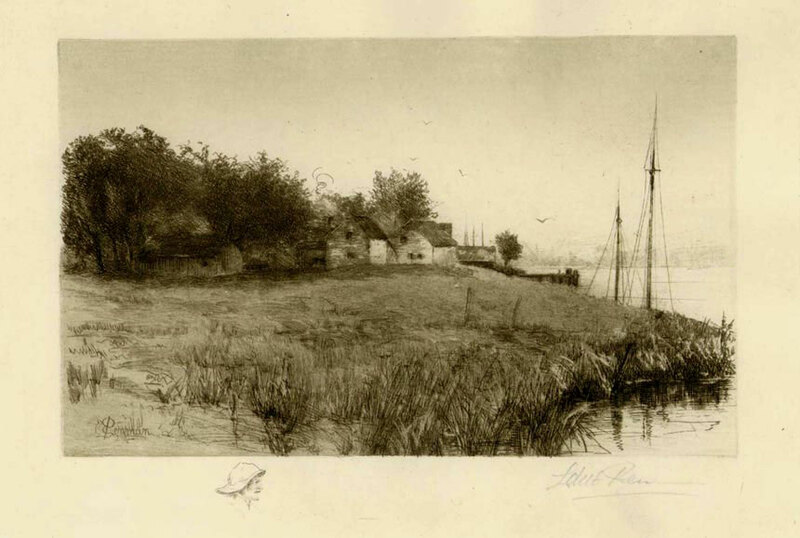 An atmospheric image of Long Island, this etching measures 7 5/8 x 11 1/4 inches, 1884, signed and dated in the plate, framed. 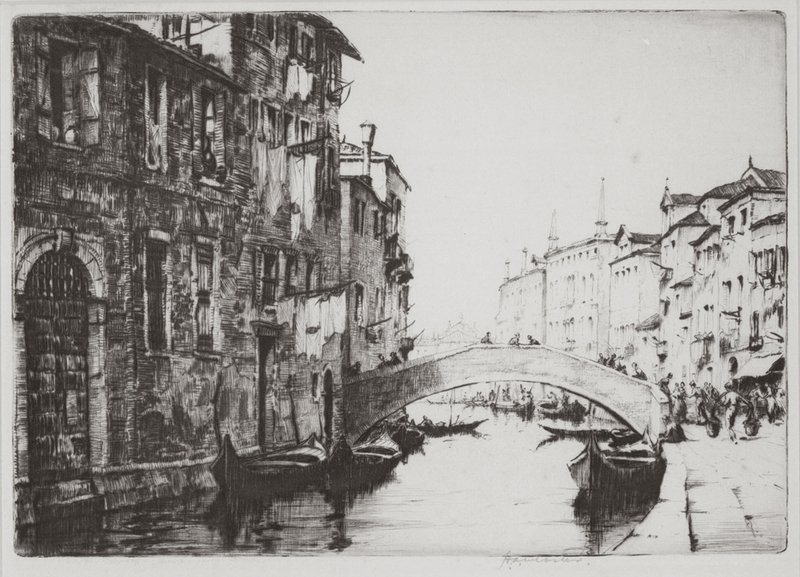 Mary Nimmo Moran was one of the leading women etchers of the late 19th century, and along with her husband, Thomas Moran was at the forefront of the etching revival. 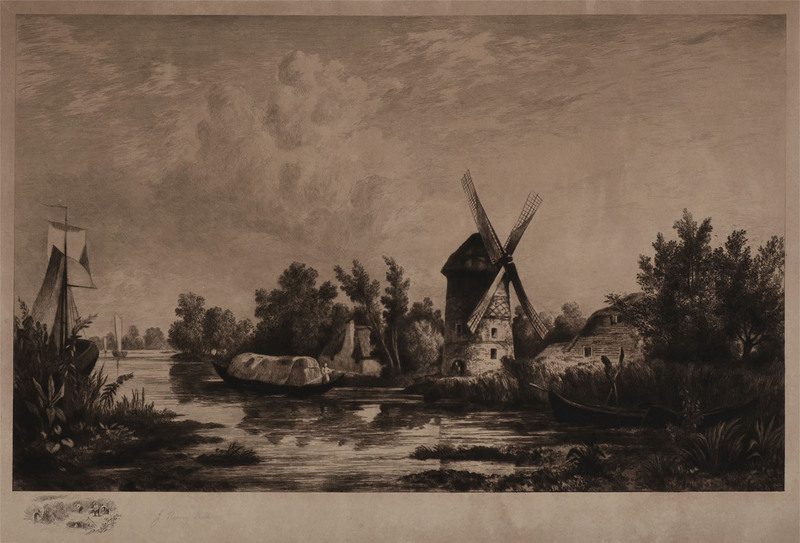 Known for her originality and boldness of her etchings, Mary Nimmo Moran was a member of the Society of Painter- Etchers and the only female member of the Fellows of London's Royal Society of Painter-Etchers. Engraving after a painting by H. Brueckner. Image size 15 1/4 x 21 1/2, Published by John McRae, New York, 1866. Etching, image size 9 5/8 x 13 1/2 inches, plate signed and dated l.l. "Stephen Parrish 1883". Etching in sepia ink, image size 6 1/8 x 8 3/4 inches, 1883, cat: Tyler- 26, printed on Japan paper, plate signed in reverse, l.l, pencil signed l.r. 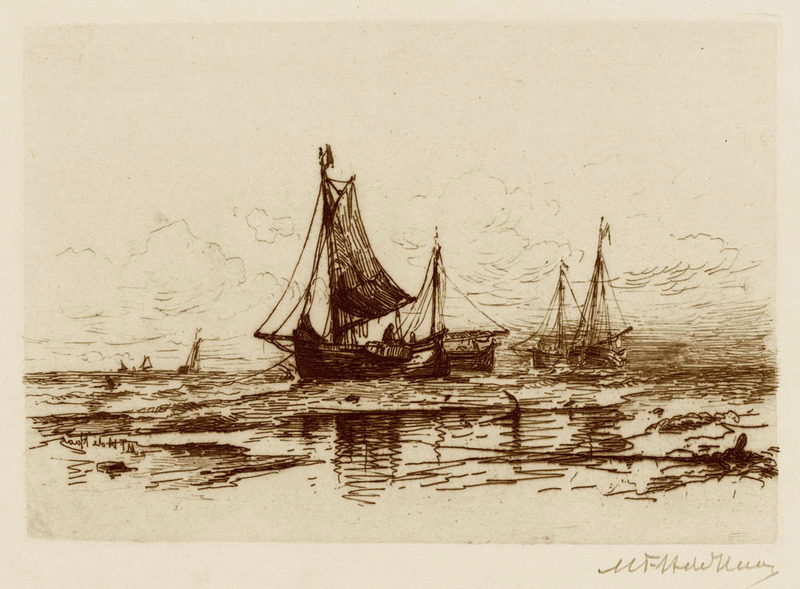 Original etching by American 19th century artist Peter Moran. The title of this work is: "A Showery Day". It was created and printed in 1875. The etching is hand signed in pencil lower right. It is printed on a thin chine collet paper adhered to a thicker sheet. The image measures 3 X 5 1/8 inches. A rich impression. 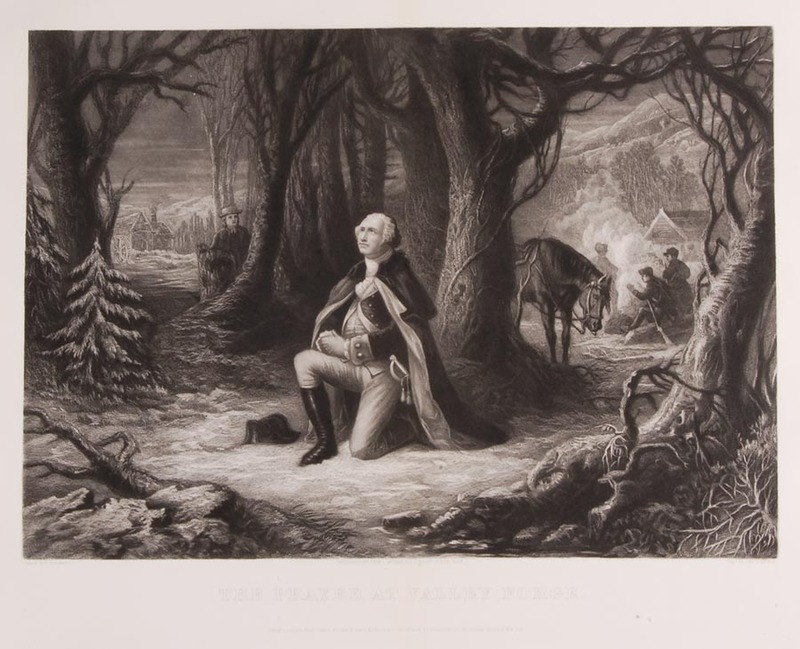 This image appears in the Wright catalog as image number 6..
Etching, image size 7 1/4 x 12 3/4 inches, pub. 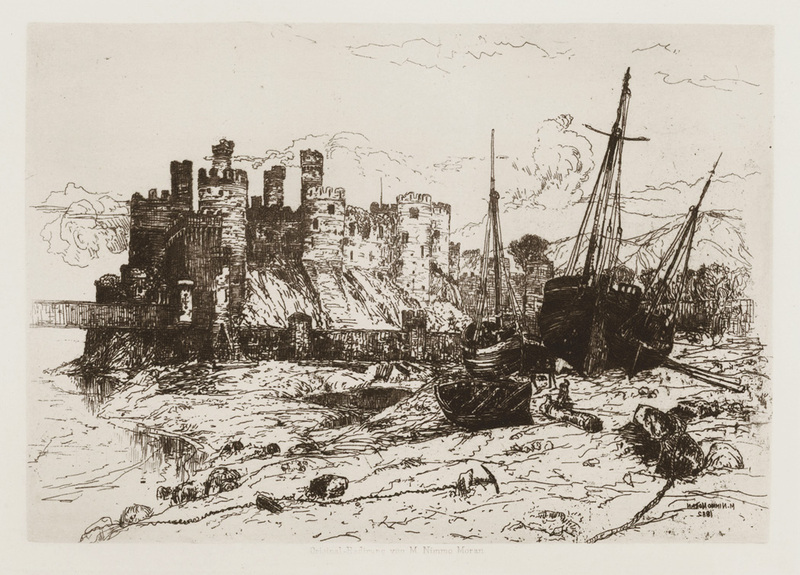 1882, plate signed "J. M. Falconer 1882", printed on medium weight laid paper. 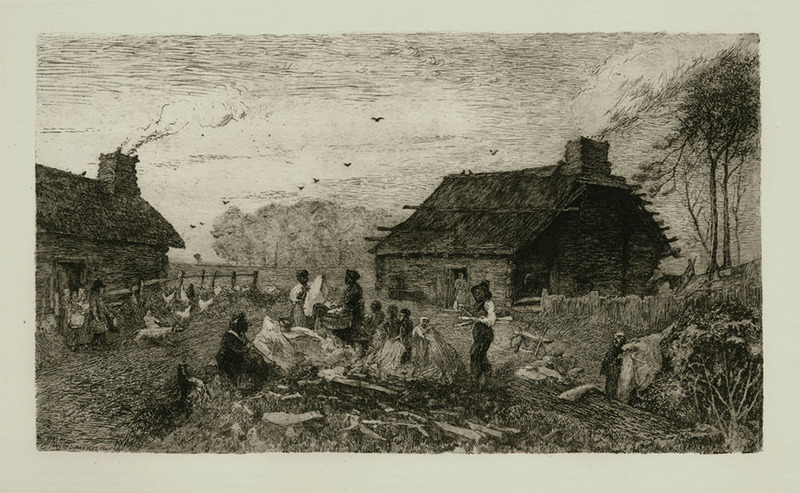 Etching, image size 18 x 29 1/4 inches, c. 1880, remarque l.l, pencil signed. 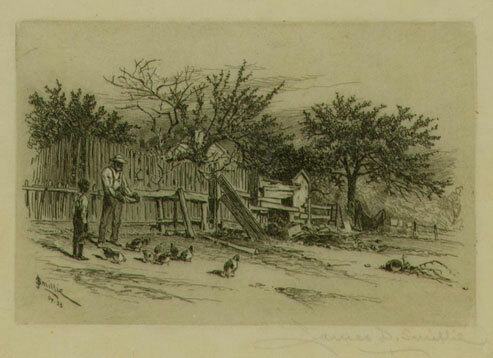 This is an atmospheric etching in sepia ink, image size 4 3/8 x 6 inches, 1887, cat: Rice-84, signed and dated in the plate. C. A. Platt was born in New York and studied art at the National Academy of Design, the Art Students League and the Academie Julian. 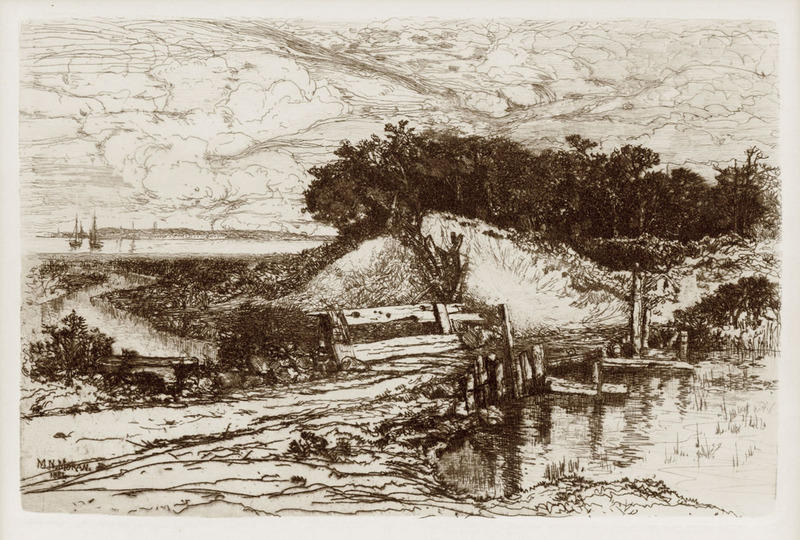 He was a very successful painter and etcher, known for his delicately rendered New England landscapes; and was also a very talented architect. He was close friends with fellow New England etcher Stephen Parrish and was a member of Saint-Gaudens' Cornish Art Colony. 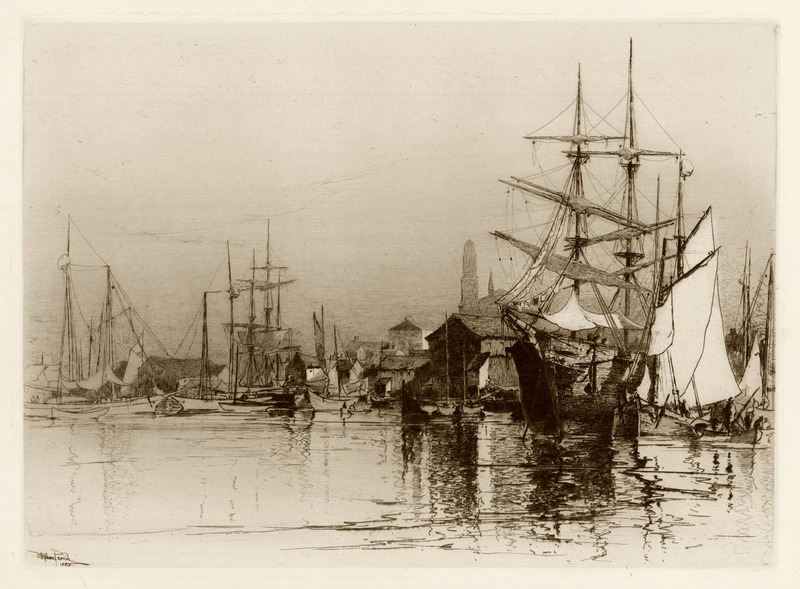 An atmospheric etching by Charles Mielatz of a quiet New England harbor, image size 7 1/2 x 22 3/4 inches, published in 1890 by Fiskel, Adler and Schwartz, New York, signed and dated in the plate, with a starfish remarque in the lower margin.